Another way to add a new dashboard tile is by pinning an entire report page. This is an easy way to pin more than one visualization at a time. Also, when you pin an entire page, the tiles are live; you can interact with them right there on the dashboard. And changes you make to any of the visualizations back in the report editor, like adding a filter or changing the fields used in the chart, are reflected in the dashboard tile as well. 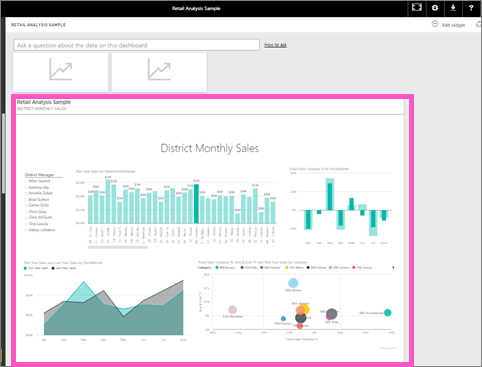 Pinning live tiles from reports to dashboards is only available in Power BI service (app.powerbi.com). You can't pin tiles from reports that are shared with you. Watch Amanda pin a live report page to a dashboard and then follow the step-by-step instructions below the video to try it yourself. Open a report in Editing view. With no visualizations selected, from the menubar, select Pin Live Page. Pin the tile to an existing dashboard or to a new dashboard. Notice the highlighted text: Pin live page enables changes to reports to appear in the dashboard tile when the page is refreshed. Existing dashboard: select the name of the dashboard from the dropdown. Dashboards that have been shared with you will not appear in the dropdown. Select Pin live. A Success message (near the top right corner) lets you know the page was added, as a tile, to your dashboard. From the navigation pane, select the dashboard with the new live tile. There, you can do things like rename, resize, link, and move the pinned report page. Interact with the live tile. In the screenshot below, selecting a bar on the column chart has cross-filtered and cross-highlighted the other visualizations on the tile.